If you’ve hung around Chatfield Court at all then you know that we’re all about DIY, there’s nothing that we won’t tackle ourselves. Some of the projects that we’ve done were more advanced, like the granite countertops we installed in our last house, but most are easy enough that anyone can do them. 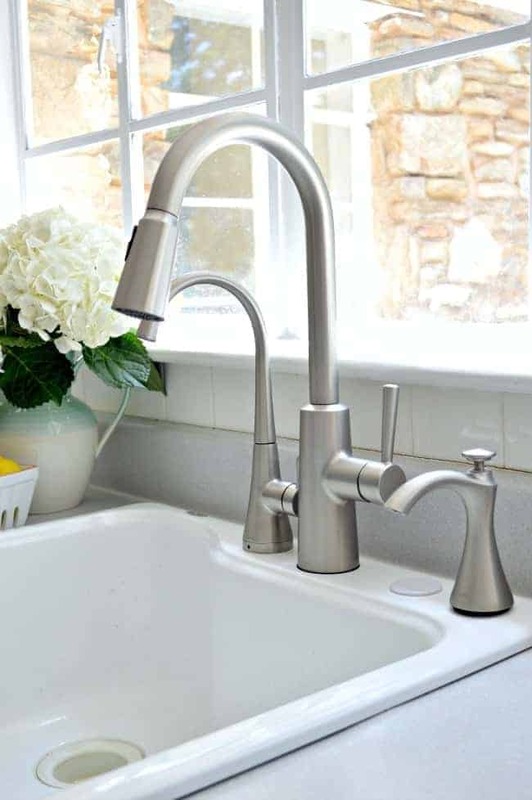 One project that falls under the “anyone can do it” category is installing a new kitchen faucet. Sure, there are some instances where you may need to call a plumber but, for the most part, it’s a total DIY. This is a sponsored post. The Riley faucet, soap dispenser and beverage faucet and filter were all provided by Moen but all opinions are 100% my own. Changing the kitchen faucet in our new house was at the top of our project list from the day we closed. When we first looked at the house, the one that was here wasn’t properly attached to the sink, actually, it wasn’t attached at all. 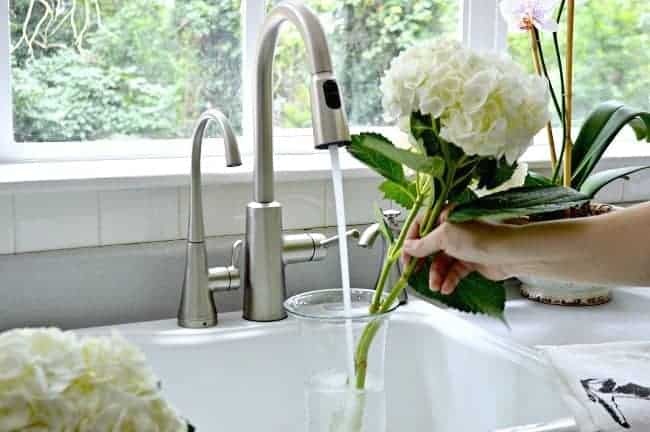 I’m not sure how they were even using it but we knew that we needed a working faucet, preferably one that was attached to the sink, so that was our first priority when we moved in. It’s not the best picture, but this was the broken faucet. 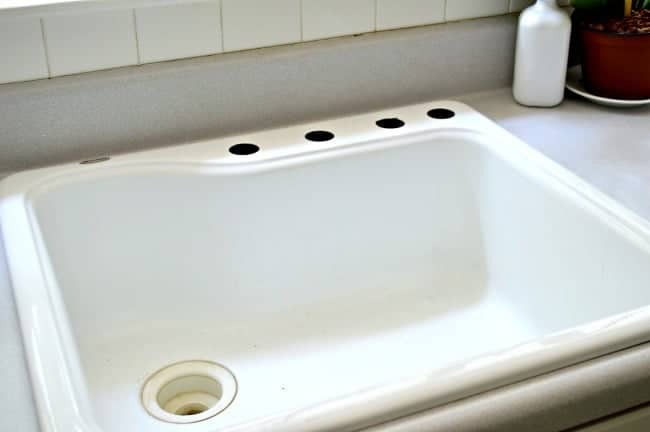 It didn’t look that bad but you could pull it right out of the sink. 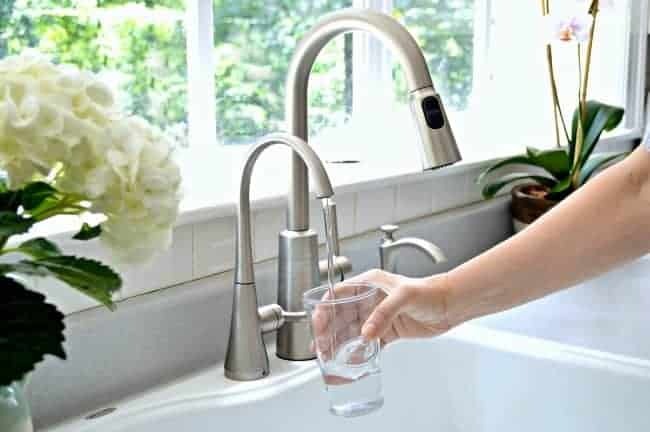 We had planned on getting the same faucet that we bought for our Illinois house, but when we opened the Riley faucet, soap dispenser and beverage faucet with filter that Moen sent to us, we knew that we hit the kitchen faucet jackpot. 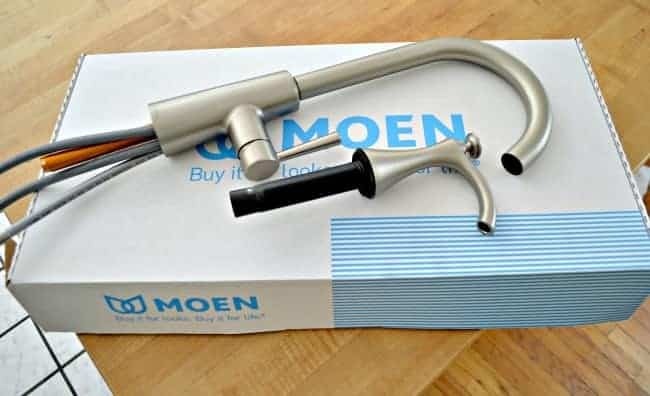 Like I said, we installed a new faucet in our Illinois house, and other houses that we’ve lived in, so we knew what to expect, but the Moen faucet was different from any other faucet we’ve ever installed. Besides its beautiful design, the instructions that came with each piece were clear and easy to follow and they all ended up being so easy to install. Like…incredibly easy to install. 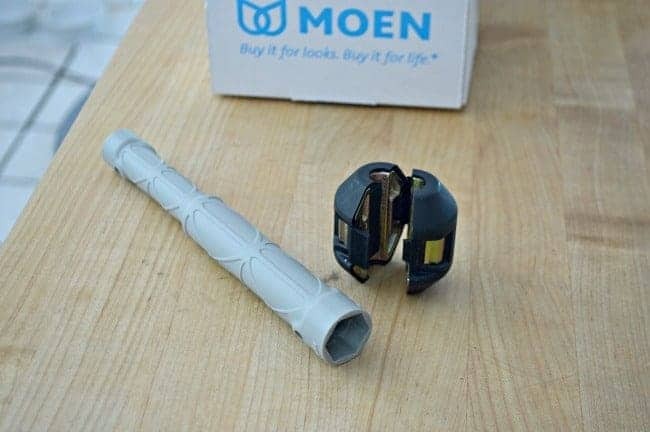 All three pieces came with everything needed to install them, even a handy wrench that lets you get in the tight spaces under the sink. Hubs was beyond thrilled when he found it in the box. Once the new faucet was done, it was time to install the beverage faucet and filter. I’ve never had filtered water from the sink, I’ve always had a dispenser as part of the refrigerator, but the fridge that came with the house didn’t have one so we needed to figure another way to get filtered water. The new faucet and filter were the perfect solution. It really makes it so much easier to fill pots and pitchers. I’m loving my new faucet, soap dispenser and water filter. Besides the fact that they were all easy to install, they look awesome and they resist water spots (which means I don’t have to wipe up after the hubs washes his hands). 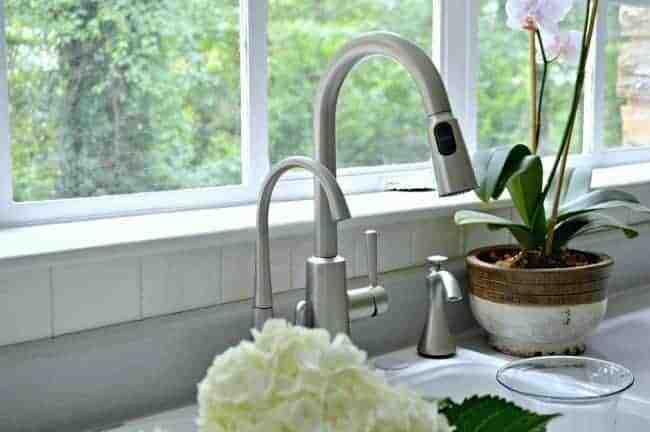 I hope that I’ve convinced you to DIY if you ever need to replace your kitchen faucet. Now excuse me while I go cross off project #1 on our very long to-do list. One down…536 projects to go. Woohoo!!! What projects have you crossed off of your list lately? I like the beverage dispenser part and the polished surface. Don’t you wish all your projects were that fast and easy? I’ve never had a beverage dispenser and I’m really loving it. I only drink water so it gets a lot of use. What a lovely Faucet. My youngest son is an electrician but he changed one out for me when I lived in a condo. He even turned it and hooked it up opposite as I am left-handed. When I sold the condo I had to inform the buyer of this as he never realized this could be done and thanked me for letting him know. Continued prayers for your foot to heal quickly and completely so you can ‘enjoy’ making your stone cottage Home.!! Thanks Patricia. I never thought of turning it around for someone who is left handed. That’s a great tip, thanks for sharing. Thank you for your prayers. I am getting there, slowly but surely, and looking forward to the day that I can give up the clunky boot. I appreciate your visit and comment. Hope you have a great weekend. 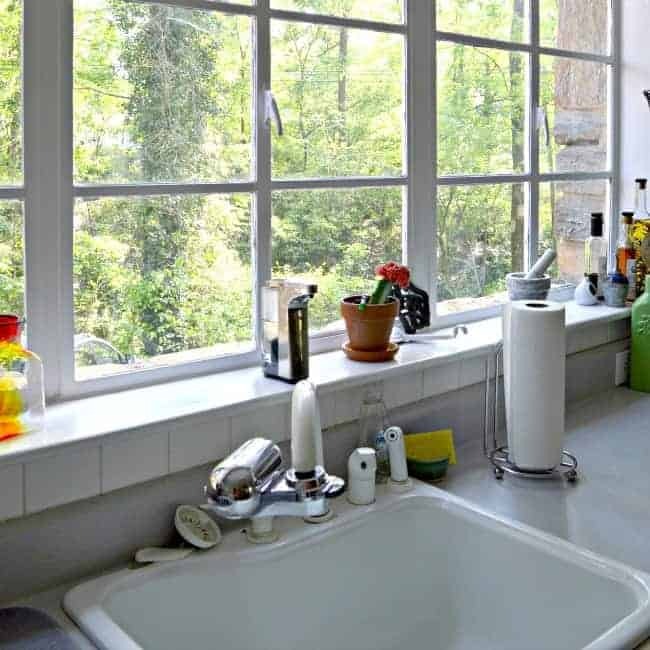 Hi: That is just beautiful, and I like the farmhouse sink too. I hope you are well on your way to recovery. Have a great week. Thanks Brenda! I’m really loving the new faucet.